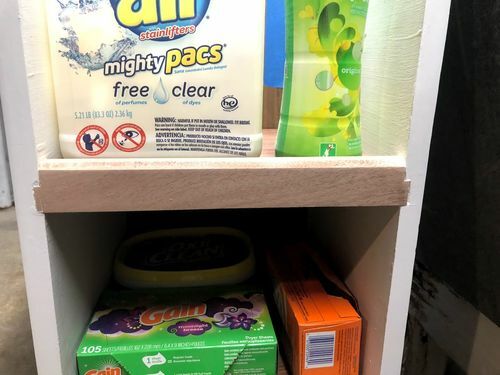 Hello AllI was back on the honey do list the last week or so and my wife asked me to remedy the storage solution that we currently had down stairs next to our washer and dryer in the basement. 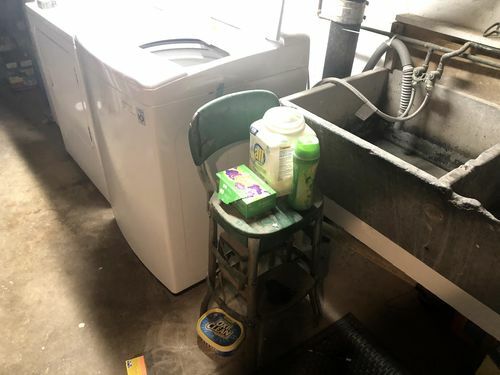 We were currently storing all the detergent and fabric softener on a very old chair so I decided to use up some scrap sheet goods that I had lying around. Here is the old set up.DESIGNI went to my Sketchup program and through this model together keeping in mind vertain dimensions that I needed, although I hated that chair that we were using I like the foot print that it occupied so I didn't want to make my new unit any bigger, I also wanted to place a trash can on the bottom shelf so I spaces the bottom shelf the appropriate distance from the middle shelf so as to fit it in. I had so much veneered MDF lying around that was given to me some time ago and to be honest I really don't like using MDF but I had a few different veneered panels I chose to use it any way it was only for the basement and no one would ever really see it. 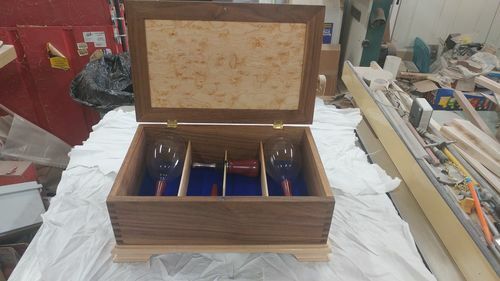 But the funny thing was as the project progressed I was doing things such as using hardwoods and adding curves and visual interesting traits to the case that looks like I could store it upstairs. 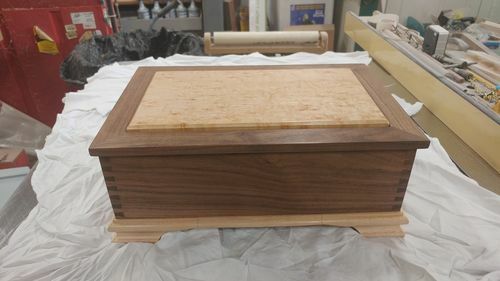 I usually practice things on basement and workshop projects that I don't do on expensive projects in the main part of the house, you could say they are my experimental projects.Most of the panels I used were 3/4” MDF and I also used some 3/4' solid oak and maple for the edge banding on the sides.SOLID WOOD EDGE-BANDINGAs I mentioned I used solid wood edge-banding to cover the ugly MDF edges on pieces that will be visible. Although this is not hard to do it is a little time consuming here are the steps that I took in applying the edge banding to the case sides. 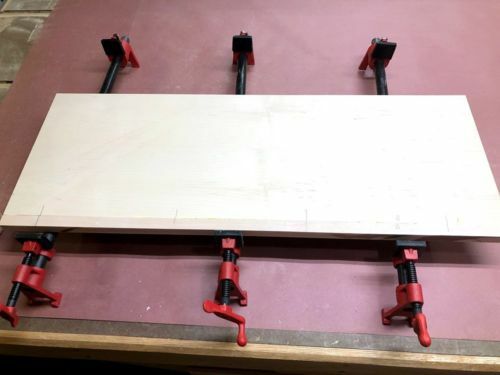 I took an oversized blank and since I decided to use biscuits to attach these edges to the MDF panels I needed to mark a line where the slots needed to be applied using my biscuit jointer. 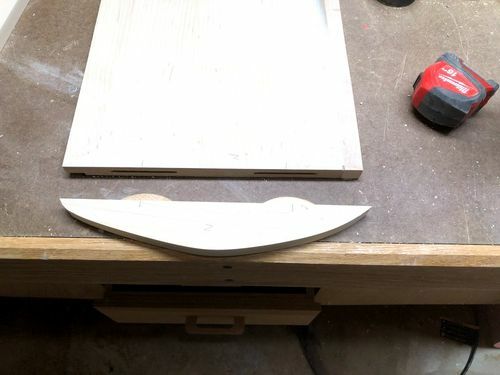 Once I used my biscuit jointer to cut the slots I took the blank over to my table-saw and ripped them along each edge of where the slots were located. I use this method because its safer to cut the biscuit slots into a wider workpiece than a narrow one. Added glue to both the MDF side and the edge banding and clamped them all together. Used my router with a flush trim bit to even up the edges of the solid wood it was a little oversized but once you use the router its like it was always a solid panel. Here is the case sides with the edge-banding clamped and glued in place.JOINERY TIMEI decided to use Rabbet and Dado joints to assembly the case work so after consulting my plans on where to locate the dadoes I installed the dado stack that matched the shelves wood thickness and went about placing matching dadoes in each of the sides as that was the only workpieces in this project that were to receive the cut outs. 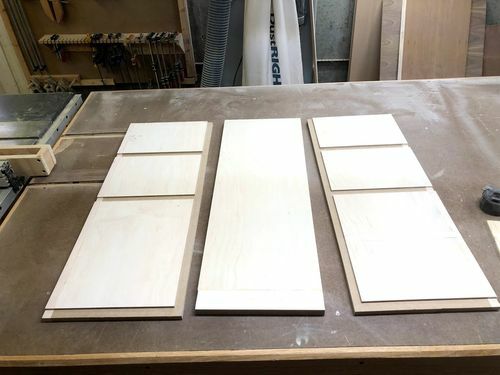 Also there was a very good reason for installing the solid wood edge banding before I tackled the joinery part of the project and that is simply because it is much easier to cut one solid panel with the dado stack instead of cutting individual pieces and hope the line up later. Adding a curved solid wood feature to each side. To achieve this I needed the a solid piece of maple and turning it into a curve design. To attach this piece to the side I again turned to my biscuit jointer and attached it using biscuits and glue. To cut the shape I roughly drew and outline pleasing to the eye, cut this design out on my band saw and then did little more shaping using my oscillating belt sander. As far as the shelf front go I decided to add two different router profiles to the front an back edges of the top of the piece. 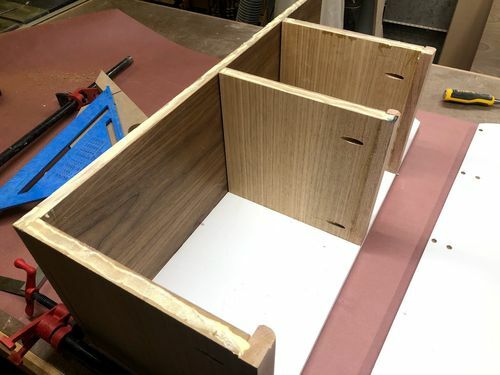 I will also be removing a section f the shelf front so as that I can just glue it in front of the shelf and that way the shelf front will be flush with the rest of the case sides. THE GLUE UP The glue up was very simple I decided to glue and screw 1 side at a time and then once one side was completed I turned the case to the other side and glue and screwed that together. Unfortunately I don't have too many pictures of this except the one below. 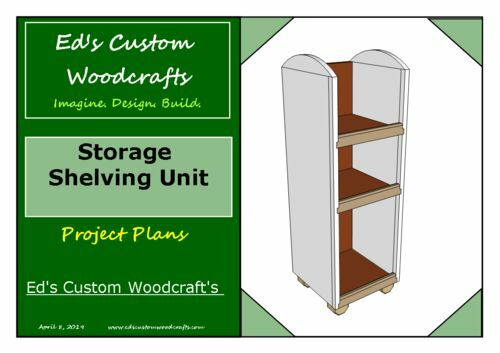 FINISHED SHELVING UNITThe only thing that was left to do was to give he unit 1 more coat of paint and well I didn't take any pictures of that as it didn't offer much in the line of valuable content. 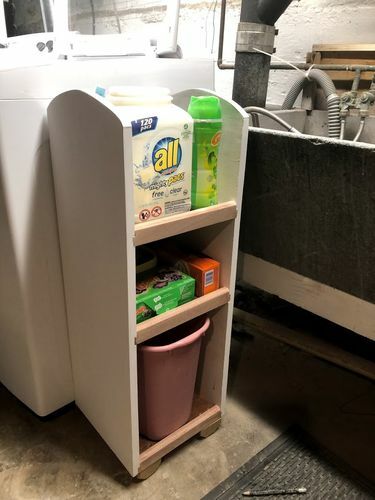 I really like how the unit turned out, but to be honest MDF is not my favorite material and if I could do it again I would definitely use cabinet grade plywood and then stain it. There is just something about MDF that I just don't like, it cannot take a screw very well and well to be honest it hates glue, it just absorbs it all day long ad nothing sticks that is why I needed to incorporate metal fixings to the case sides. One more thing I know that plywood has a very thin wood veneer on the face well this MDF had even less and I could not sand the unit because it would remove the paper thin veneer that was on the panel.But all in all it was only for a basement utility unit and looks really didn't matter that much and it fulfilled a need near my washer/dryer. 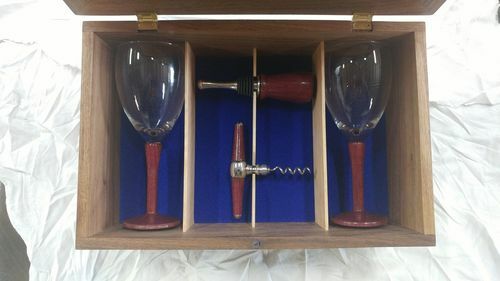 Had to make a wine glass box, glass stems, cork screw, and stopper for a wedding. Didn't have a lot of time so it's not up to my standards, but the happy couple were pleased.